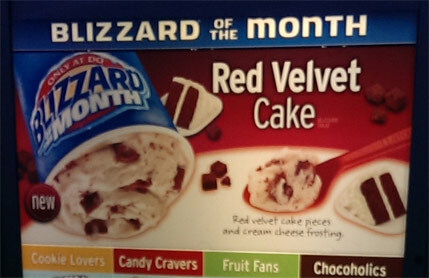 [New for 2014, Back for 2015 and 2016] Alright, it's Super Bowl Sundae Sunday and I need to go veg, but first I need to tell you about the excellent blizzard of the month. Yeah, I really like this blizzard. Sure, most of the cake pieces got obliterated, but when you get one, man, they are perfect. Soft, fresh, not dried out, and you can actually taste the true chocolatey nature of red velvet cake. All too often it's near-flavorless, red colored cake in these type flavors, but not here. If you get a whole chunk, those chocolate vibes are there and they really hit the mark. The overall flavor is great too. It's authentic, pleasant, and distinct but not too strong. Like any good blizzard, it tastes like it's name sake, I taste fresh cake here and I'm digging it. Note, I said cake, and not cake flavor or cake batter flavor. Even the cream cheese frosting is subtle. I get that sweet frosting vibe with a hint of cheese, but it's respectful and lets the soft-serve do it's thing. 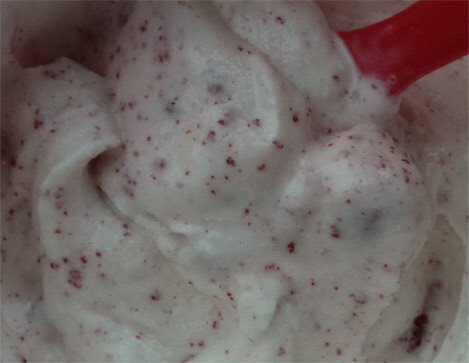 The tangy cream cheese flavor was pretty assertive in my Blizzard, in a good way. I wish there were bigger cake pieces left, I only had 3 tiny ones (I split with my daughter and don't know if she had any) and the rest was pulverized. I added some of these: http://www.kingarthurflour.com/shop/items/guittard-bittersweet-chocolate-sprinkles-6-oz . Best sprinkles ever! 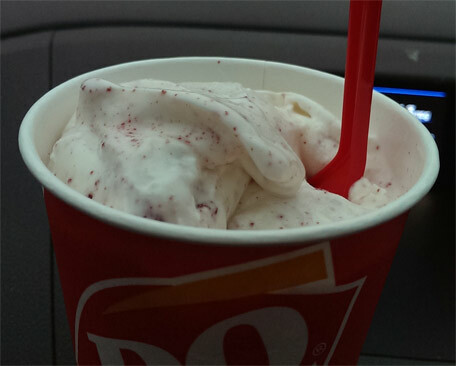 When I called last week to get a Red Velvet Blizzard Cake, they told me lots of the DQs were out of the cake pieces. I ended up finding one with some left. Definitely worth the trouble. A layer of cake pieces in the middle and a bunch on top (if no message is requested.) Even better than Ben & Jerry's Red Velvet if you ask me. @Serena: hope you feel better! @SM: sprinkles make everything better! @Josh: oh man, does that sound good!